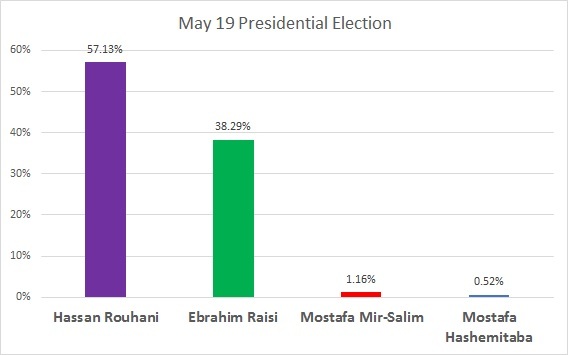 On May 20, Iran’s Interior Ministry announced that President Hassan Rouhani won a second term by a wide margin. He garnered 57 percent of the vote, compared with 38 percent for his closest rival, hardliner Ebrahim Raisi. 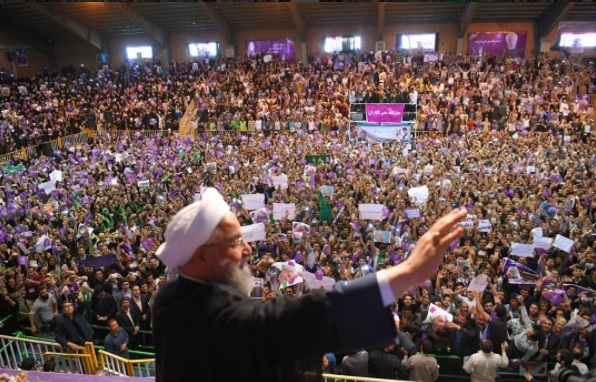 Rouhani’s victory was a significant blow to conservatives, who were seeking a comeback following a poor performance in the 2016 parliamentary elections. Rouhani won with the support of both reformists and centrists. He campaigned hard on economic improvements made during his first term. Rouhani also presented the election as a stark choice between freedom and suppression. For Iranian leaders, voter turnout is critical to prove the legitimacy of the Islamic Republic. On May 19, election officials extended the deadline four times to make sure as many people as possible could vote. A total of 41.2 million ballots were cast for a turnout of about 73 percent. 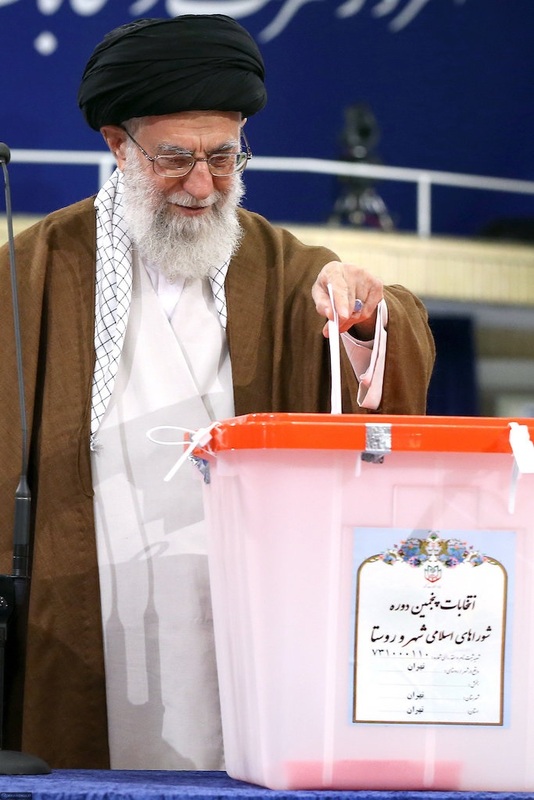 On May 20, Supreme Leader Ayatollah Ali Khamenei commended voters for the “massive and epic” turnout. “The winner of the yesterday's elections, is you, the Iranian people, and the Islamic establishment, which has managed to win the increasing trust of this big nation despite the enemies' plot and effort," he said. The election was widely seen not just as a contest for the presidency, but also for the political trend in the post-Khamenei period. In July, the Supreme Leader Ayatollah Ali Khamenei will turn 78. He is likely to retain the top position in the Islamic Republic until his death. Succession is a taboo topic in Iran, and Khamenei does not have a clear protégé. 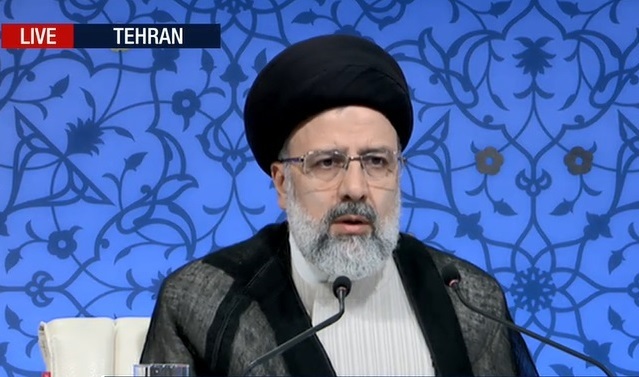 Raisi, a mid-ranking cleric in charge of a major holy site and a charity, was thought to be potential successor. The presidency could have been a stepping stone to becoming supreme leader. During the campaign, Raisi portrayed himself as the champion of the poor. He promised to triple cash handouts to the impoverished. Raisi blamed Rouhani’s government for high unemployment and economic mismanagement. Raisi’s performance in the three presidential debates was lackluster, but his populist rhetoric won him many supporters. He also was endorsed by some senior conservative clerics. Some of Raisi’s rallies attracted thousands. Rouhani’s vice president, Eshaq Jahangiri, earned the respect of many Iranians over the course of the campaign. During the presidential debates, he passionately defended the Rouhani administration’s record. Jahangiri was often the most dynamic speaker and confronted the three conservatives in the race without hesitation. In the 2013 election, Rouhani won with just under 51 percent of the vote. His nearest rival, Tehran Mayor Mohammad Bagher Qalibaf, earned about 16 percent of the vote. The turnout was about 72 percent. Iranians not only voted for president on May 19, they also selected municipal council representatives, who are critical to local governance and also serve four-year terms. Reformists and centrists dominated in the races for some 39,500 seats. In Tehran, Rouhani supporters won all 21 seats, taking control of the city council from conservatives for the first time, according to a preliminary tally. And only two of the 11 people who made the reserve list were hardliners. Mohsen Hashemi Rafsanjani, son of the late former president Akbar Hashemi Rafsanjani, won a seat. The reformist won 1.7 million votes, more than anyone else. He received more votes than Raisi received in Tehran in the presidential race. Mayors are selected by council members, so reformists will have the opportunity to replace Qalibaf when the new council convenes in 45 days. Rafsanjnai may be a top contender. Tehran’s city council will also look different because a record number of women won seats, six. The last council only included three women. Reformists and centrists made gains outside Tehran as well. As of May 22, the vote counts had not been finalized. But reformists and centrists seemed poised positioned to take all the council seats in both Isfahan and Mashhad. In Shiraz, 12 of 13 seats went to the reformists who also were leading in Kerman, Semnan, Tabriz, and Zahedan. Female candidates were also successful with 415 women being elected to various councils in Sistan and Baluchistan province alone.